Lettering a car after it has been painted. 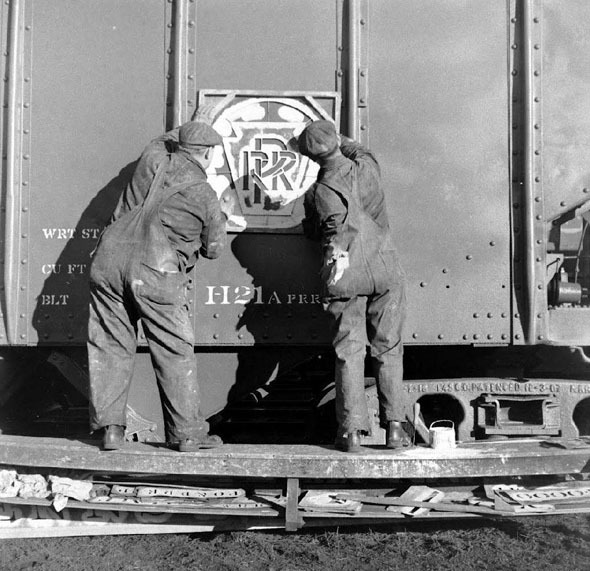 I have a group of photos that show the process in 1939 of painting and lettering rolling stock. Seems like they did not have any Champ or Walthers decals back then. I will be posting this series of photos shortly. This past weekend we had temperatures nearing 40c (humid) so I had a good amount of time in the basement. I think I actually have had more basement days this summer than any other summer. Not a bad thing as it has given me time to clean up a few projects I had began in the spring. 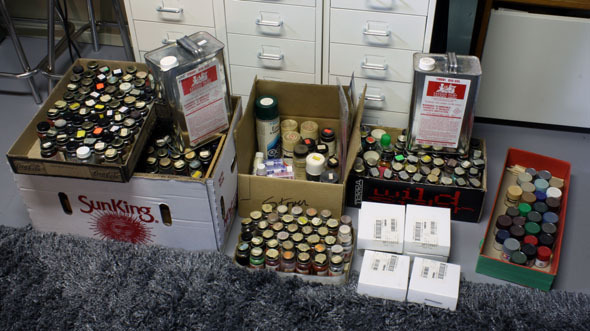 I have also purchased a lot of paints, detail parts, rolling stock and structures from the Bob Bowes estate. Bob was a excellent rolling stock builder who liked to modeled trains running through NY State...meaning a lot of New England cars and kits. He also had his own home road named equipment, but everything is very detailed and nicely done. I purchase maybe 20 (but in actual fact over 30) pieces of rolling stock plus some kits which still need building, all his paint and a good amount of structure kits and detail parts. I now have a few hundred jars of Floquil to sort out and to store away. The railroad paint I recently acquired. The big box has a few trays of unused bottles. So over the next month I will be showing you a good amount of rolling stock, mine and Bob's. 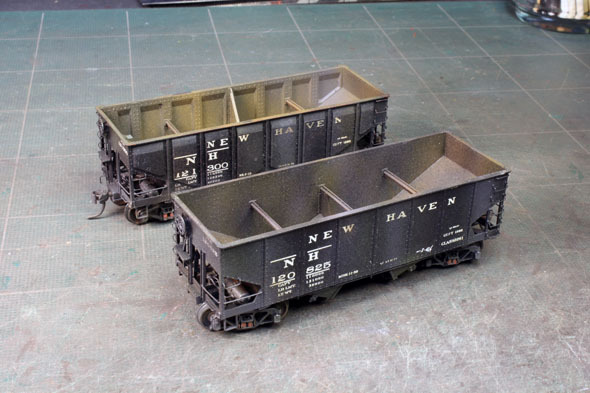 Two of Bob Bowes hoppers which are I believe Tichy models. They were in the $5.00 box missing the odd coupler or stirrup. Will not take much to get them rolling on the WRD. 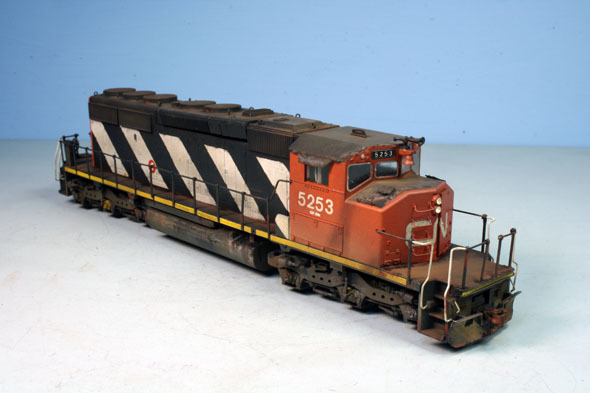 A new acquisition this spring was a dummy engine built back in the 1980's which all I did was apply weathering. I actually tried a new technique of clear-coat peeling and chipping which went extremely well. I will cover this engine shortly or better yet check an upcoming CARM issue for the full story. 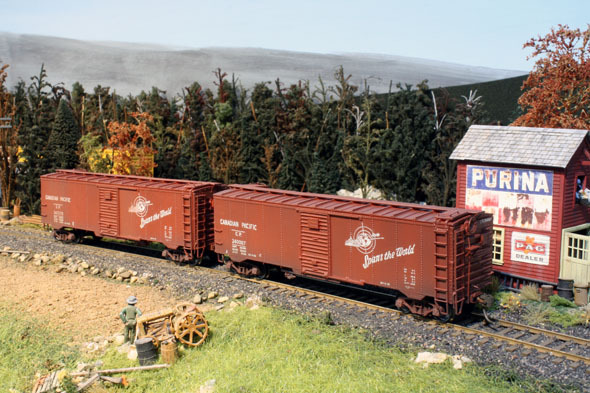 From the Bob Bowes estate I picked up two 1929 CPR mini-boxcars built from Yankee Clipper kits, one for Peter and one for the WRD.